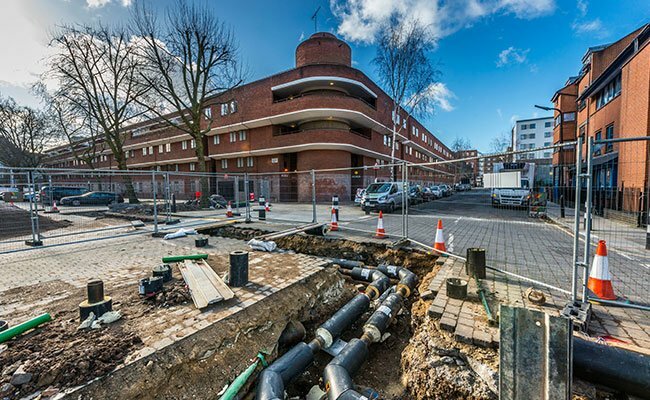 Camden Council has today unveiled the first phase of its new eco-friendly decentralised energy scheme in Somers Town, which will provide heat to 339 homes later this year. Costing £3.04m and fully funded by The Francis Crick Institute, the first phase is entering the final phase of construction by Vital Energi and has seen over 500m of underground insulated district heating pipework laid in the area. The new energy centre powering the network has been designed to fit within a Camden-owned basement car park alongside new cycle parking facilities and will house three 1.3MW boilers. The whole concept of this decentralised energy scheme means that heat and later energy will be produced locally. The new low carbon energy network replaces several ageing communal heating systems serving the homes that were coming towards the end of their working lives and is a key component of Camden’s carbon reduction strategy which aims to cut borough emissions by 40% by 2020. It has been designed to be retrofitted with more sustainable technologies as they emerge in the future. The second phase of the scheme will see combined heat and power (CHP) technology installed at the energy centre in 2016, with the electricity being sold to the Francis Crick Institute. Longer term the aim is to expand the network to connect to other existing and new developments in the area including new homes, schools and community buildings to be built under Camden’s Community Investment Programme. Supported throughout by the GLA’s Decentralised Energy for London programme, the scheme was originally borne out of feasibility work showing the huge potential along the Euston corridor. For further information people can log on to www.camden.gov.uk/de.